O.P.I 'Let me entertain you' notd | S J M W E L L - Fashion, Beauty & Lifestyle blog. I am in love with OPI varnishes, it's very rare for me to find one i don't like- yesterday i went to get my nails painted and after having a little hunt with the girl's there, we all decided this was the most loveliest pink, it's glittery and absolutely lovely, after swatching this and a few other's i chose this one. There was one like this but had a coral/yellow holagraphic effect which changed in the light. It reminded me of the silver glitter paint they brought out in their new designer collection, it was quite hard to get the glitter to shine while taking the photo in the sunlight! While i was at the salon the girl doing my nail's had such a beautiful purple on i asked if she had that, she said it was permanent, so all of us in there got on to the discussion of it- Shellac nails! A lady next to me had it on her toe's and was still shiny, perfect and like she'd just had it done, she'd had it on for an amazing 8 weeks! they recommend it last's 3 weeks. It dries in minute's which is also very handy because i hate ruining my nail's after painting. Even though i am extremely against sun bed's, im sure many reader's know how spf and sunshine crazy i am, well in order for it to dry and set properly Shellac use the same type of bulbs they use in sunbed's, however it won't be as damaging if you aren't having it done so regularly. 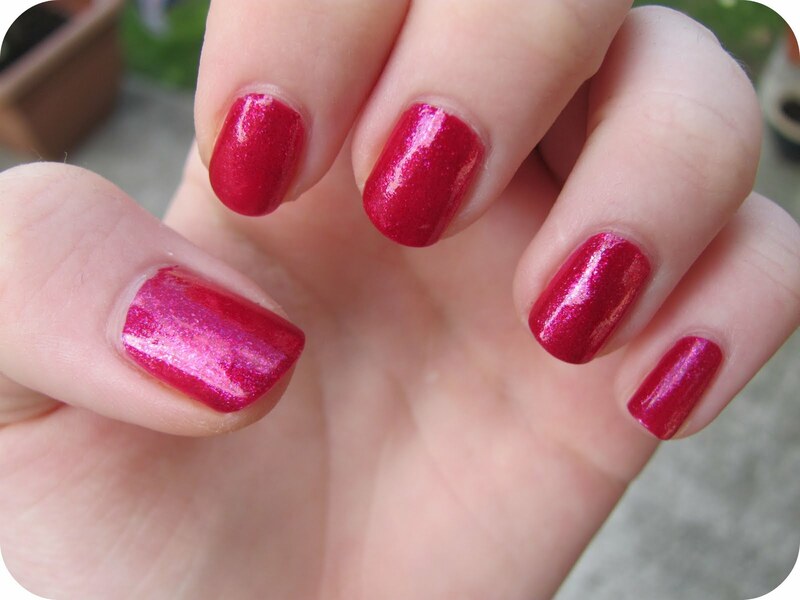 opi nail varnish- let me entertain you. i booked in to get my hand's done and im very excited, i love doing my own nails and nail art it's usually something i do on a sunday evening but with college starting i won't have time so this will be handy, and i love shiny looking nail's. I'll be keeping you updated to see how long it lasts and how it look's, i'm not actually having "shellac" done but it's the same concept.